This story originally appeared on Aug. 21, 2013. Comic shops are full of war stories. The Unknown Soldier is a bleak book about a haunted man with a face wrapped in bandages waging a lone war against the brutal Lord’s Resistance Army rebel group. The Pride of Baghdad tells the story of lions trying to survive the U.S.-led invasion of Iraq. Army@Love exposes the surreality and terror at the heart of the soldier’s experience. War comics weren’t always this grim. Instead, comics were once used more frequently to celebrate and sanitize war for propaganda purposes. It wasn’t until an irreverent comedy and horror writer named Harvey Kurtzman — of Tales from the Crypt and Mad magazine fame — rewrote the script. But it wasn’t easy. Kurtzman’s comics were subject to moral panic and industry censorship, and risked being forgotten as the wars which inspired them faded from popular memory. However, his combination of fantasy and violence, comedy and the macabre — and the toll it takes on the bodies and minds of those caught up in it — remains king when it comes to graphic, brutal portrayals of war. 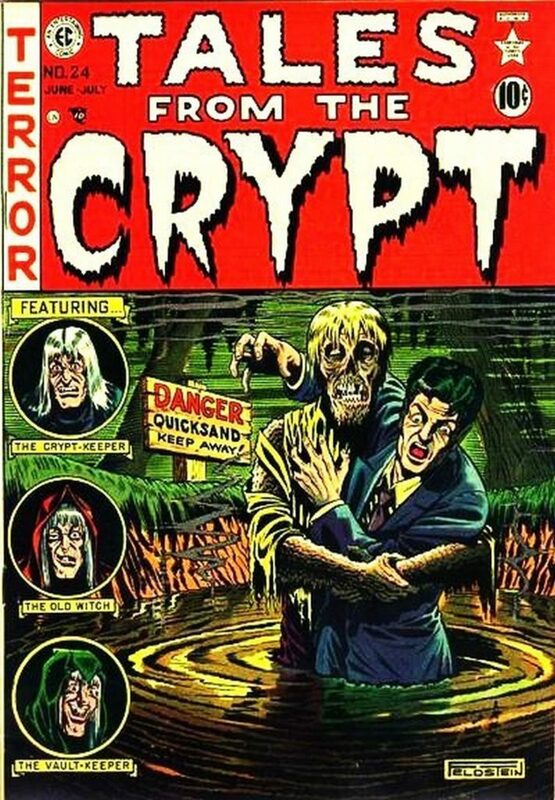 In the early ’50s, pulp comic book publisher Entertaining Comics pumped out stories of horror and suspense in lurid pulp titles like The Vault of Horror, The Haunt of Fear and Tales from the Crypt. The books were littered with black and white drawings of severed heads, rotting corpses and axe-wielding maniacs. Vibrant covers depicted strange horrors, begging the reader to buy the book and take it home. It was a strategy EC would use for a new line of war comics. Kurtzman, a writer and illustrator from Brooklyn, helped make EC a success. His macabre style and love of surprise twist endings defined the new trend of horror comics. After Kurtzman had proven himself, his boss — comic legend William Gaines — decided to set him to a new task. Gaines assigned Kurtzman to take the lead on a new adventure comic, Two-Fisted Tales, with the idea of filling the pages with stories of manly men doing (stereotypically) manly things: pirates punching people in the face and stealing governors’ daughters, explorers swinging off panel on ropes and barrel chested heroes saving the day. Meanwhile, the Korean War was heating up. China intervened as U.S. forces pushed closer to the Yalu River, driving American troops back and turning the war into a bloody stalemate. It would grind on for nearly three more years. Until that moment, war in comics had typically been presented in the form of jingoistic propaganda. Captain America knocked about Nazis and racist Japanese caricatures. Comics with titles like Battlefield Action depicted one-sided stories where “our boys” always won. There were no heroes in Kurtzman’s world. Just men trapped in desperate situations on both sides, beset by powers they don’t understand and trying their best to get by in a world filled with horror. In the Korean War comic “Corpse on the Imjin,” Kurtzman tells the story of a U.S. soldier eating on the bank of a river as a corpse floats by. The soldier wonders where the corpse came from, when he’s attacked by a North Korean soldier hiding in some nearby bushes. The soldier drowns the North Korean in the river — and sets the body downstream with the others. “Custer’s Last Stand” tells the story of Gen. George Armstrong Custer’s death and disgrace at the Battle of the Little Bighorn, but Kurtzman is clever. He tells the story from the perspective of a common soldier who sees Custer the way history has largely remembered him: as a foolhardy glory hog who lead his men into a death trap. Death, history and tragedy. These were themes of Kurtzman’s war comics. And the influence from pulp horror comics is felt on every page. 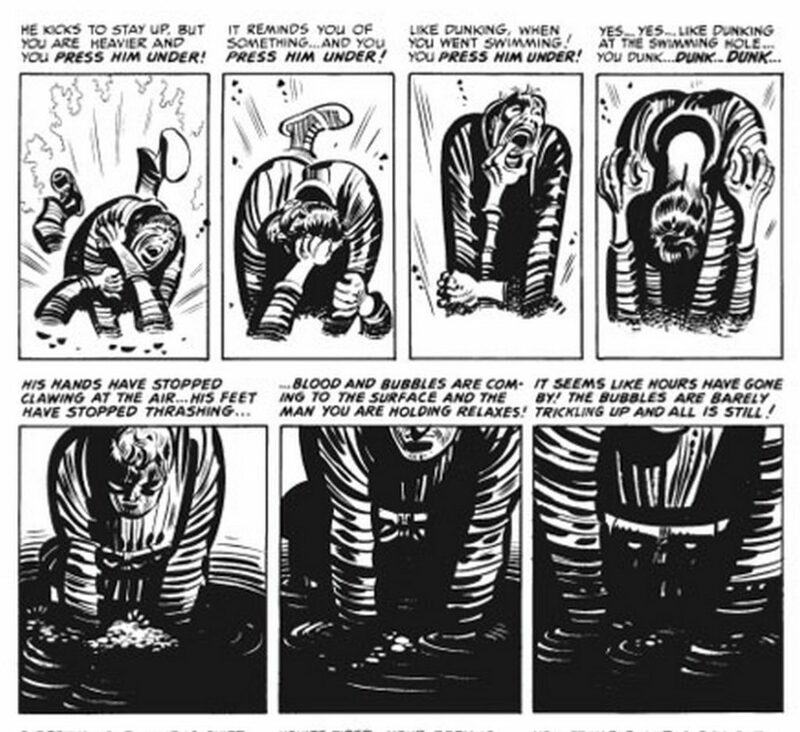 Kurtzman and his team wrote and drew realistic stories, but the lessons they learned drawing grim and horrific fantasies gave them the training they needed to depict the brutality of war. The dark and twisted images of Tales from the Crypt taught Kurtzman how to deliver his anti-war message. In 1954, two events occurred which would spell the end of Kurtzman’s comics. The Korean War came to a close, and conservative psychiatrist Fredric Wertham published Seduction of the Innocent — a book accusing comic books of corrupting the minds of youth. In the ensuing moral panic, the comics industry decided to regulate its publications rather than suffer state censorship. The result was an internal system of rules called the Comics Code Authority, which strictly limited how violence could be depicted and illustrated. 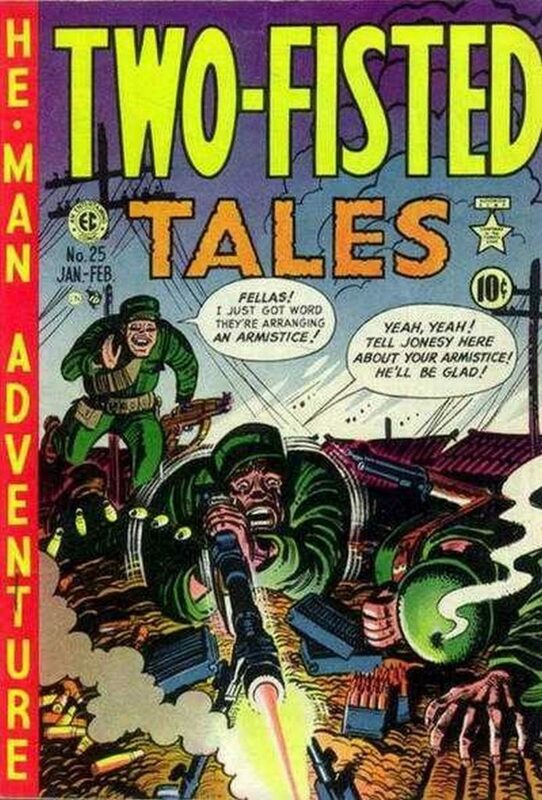 Harvey Kurtzman’s Two-Fisted Tales was too gruesome to continue being published, and the return to peacetime meant war comics were no longer profitable. One of EC’s few surviving titles, into which Kurtzman poured his efforts, was Mad magazine. But Kurtzman’s contribution to war stories had changed things. People read those stories and never forgot them. Comic writer Archie Goodwin read them and he poured those memories into his humanistic anti-war comic Blazing Combat, published in 1966. Vietnam veteran Doug Murray read them, and he invoked Kurtzman when he wrote the bleak and realist series The ‘Nam for Marvel comics during the ’80s and early ’90s. These continue to influence modern comics like The Unknown Soldier, DMZ and The Massive. Everyone writing about war in a comic format owes a debt to Harvey Kurtzman and the horror comics of the ’50s.